DEBORAH CROMBIE: Emily Arsenault burst onto the literary horizon with her debut novel, THE BROKEN TEAGLASS. The New York Times called it "a literary gem," and designated it a Notable Crime Book of 2009. 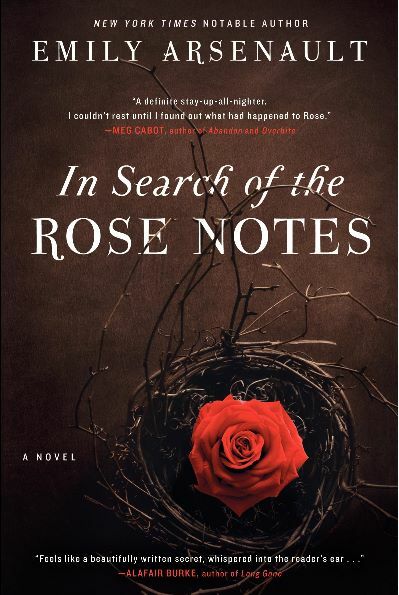 Other reviews were glowing, and Emily's second novel, IN SEARCH OF THE ROSE NOTES, is garnering equal acclaim. A starred review in Publisher's Weekly calls it "an emotionally complex and deeply satisfying read,"and I certainly agree. Told in alternating narratives from the past and present, this is a mystery about broken friendship and the unease of revisiting adolescent memory. At age eleven, Nora and Charlotte are the best of friends—until their teenager babysitter, Rose, disappears under mysterious circumstances. They decide to “investigate,” using paranormal theories and techniques they glean from a hand-me-down collection of Time-Life books. But their search goes nowhere, and leaves both girls distraught and angry with each other. In her late twenties, Nora is drawn back to her old neighborhood, and to Charlotte, when Rose’s bones are found. She was probably murdered, and Charlotte is adamant that they solve the crime. Nora—who was the last known person to see Rose alive—is forced to reconsider her memory of the events surrounding the disappearance, and her own troubled adolescence following those fateful days. And she’s not sure if she’s ready to face the secrets that begin to surface. But where did you get the idea for In Search of the Rose Notes? 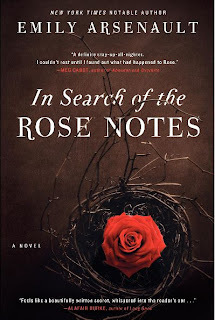 EMILY: In Search of the Rose Notes was more of a mishmash of ideas I’d been meaning to try for a long time. It started with a relatively dark story about two old friends, a lonely adolescence and a mysterious death. Then I added the Time-Life element (which came from my own childhood wish for the Mysteries of the Unknown books), because I thought it would add some much-needed humor. With that addition, I ended up changing the ages of the characters (in the past scenes) to eleven, instead of sixteen or so, and gave them the “babysitter mystery” instead of something that was originally connected to their own high school experience. So it evolved over time with lots of trial and error. DEBS: The Rose Notes is as much an intimate and haunting exploration of childhood as it is a mystery. Did you see yourself more as Nora, the narrator, or Charlotte, her best friend? Or even Rose, the baby sitter who vanishes? EMILY: I think I have a little of each girl in me, but I was probably most like Nora when I was a kid. I was relatively quiet, and like Nora, I’m afraid I was often a rather morbid eleven-year-old. I was relatively cheerful around friends and family, but whenever by myself, or trying to sleep at night, I would worry a lot about death and disasters, immortality and the soul. Nora has an excuse—the traumatic disappearance of Rose gives her a pretty dark and serious outlook on life. I was just naturally very grave at that age, for no apparent reason. (After age thirteen or so, I stopped worrying about such heavy topics—they were replaced, fortunately or unfortunately, by concerns about grades, personal appearance, clothing, popularity, and boys.) Probably kids around that tween age often have a much deeper inner life than we realize. DEBS: The novel segues so beautifully between past and present, allowing the reader to see how the girls' pasts influenced the women they have become. Did you plan the construction from the beginning? EMILY: Yes. From the beginning, I knew it wouldn’t be a book just about eleven year olds, or just about twenty-seven year olds. I wanted the reader to be able to see the characters both as kids and adults, to reflect on how they’d changed and in some respects, how they’d stayed exactly the same. I was also interested in having their adolescent selves (approximately age 16) shadow over certain scenes of the novel, even though they’re not generally treated directly, with their own scenes. For Nora in particular, that’s a version of herself that she really needs to come to terms with. I wanted the present to inform the past, and vice versa. In the book, the girls once mention something called “future ghosts.” They are at a slumber party séance, at which some of the attendees are too frightened to conjure real ghosts. So Charlotte suggests they try conjuring “future ghosts”—ghosts of people from the future. Nora wonders why a “future ghost” would be any less scary than a regular ghosts. (I got this idea from a similar slumber party experience I had had.) I liked the idea of slipping that in. While their past selves obviously haunt the adult women, it’s possible that “future ghosts” haunt the young girls as well—specters of the women they will become. DEBS: You've written two very different novels in The Broken Teaglass and In Search of the Rose Notes. What are you working on now? You and your husband spent time in the Peace Corp in Africa. Will that experience work its way into a novel at some point? EMILY: I probably shouldn’t say much about the book I’m working on now, as I’m doing a fairly major revision and things are likely to change. I can say that it’s not much like either TEAGLASS or ROSE—except that it’s a little bit of a mystery and a little bit of something else. I do hope to write about South Africa at some point. In fact, I keep taking out the beginning scraps of my “South Africa book” whenever I’m between projects—but I always keep setting it aside for something else. I’ve struggled with deciding how best to treat the subject in a way that will be most engaging to readers who’ve never been to that country. I haven’t really decided how I’ll do that yet. But it’s a book that I know I will write eventually. DEBS: Whatever you write, we'll all look forward to reading it, and we wish you tremendous success with IN SEARCH OF THE ROSE NOTES, a truly lovely and memorable novel. 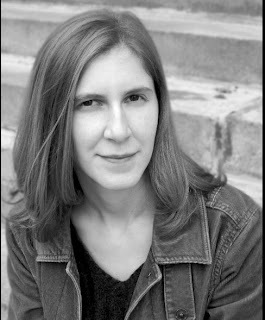 Welcome, Emily - One of the things I so appreciated in The Broken Teaglass was the unexpected bits of wry humor. A vein of sly satire. Have you worked that into the new book as well? Emily, this new book sounds terrific--can't wait to read it! Hallie insisted I read THE BROKEN TEAGLASS and I was glad I did. Love the idea of the grown-up person going back to relive and re-evaluate the memories of her childhood. You had me at Time-Life Books. That is SO Emily! Hope our paths cross in person sometime soon..I worked at a publishing company, in my youth, as a proofreader. It makes a person look at words very differently. Thanks for the warm welcome, everyone! Hallie, ROSE NOTES is a darker story than TEAGLASS, but I think it has a lot of funny moments. The humor comes from a different place, though--usually from the eleven year olds, whose interactions and observations I tried to make subtly comical. It's maybe a bittersweet humor, though, since the problem they're working through--what happened to Rose--is a serious one. In Search of the Rose Notes sounds intriguing. It's a novel I definitely want to check out.